Descubra los aspectos culturales e históricos de Chengdu en un enriquecedor recorrido de un día por la espectacular ciudad. 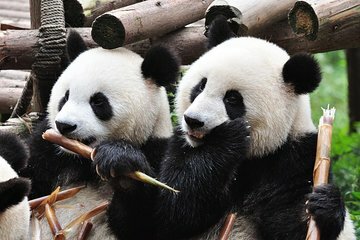 En este tour privado, aventúrese a la Base de Investigación de Cría de Panda Gigante para pasar varias horas observando pandas adorables y luego absorber el ambiente sagrado del monasterio budista zen durante un almuerzo tranquilo. Disfruta de un refrescante té en una casa de té tradicional en el pintoresco parque, y luego serpentea a través de las estrechas callejuelas de Kuan y Zhai Lane para cenar. Mejora para sumergirte en la magia melodiosa de la ópera de Sichuan. Tour de día completo en la ciudad de Chengdu. Visita el templo de Zhaojue, que data del siglo VII. Disfrute del té, el almuerzo y la cena en lugares locales. Reciba atención personalizada de su experto guía privado. Transporte hotelero ida y vuelta en vehículo privado incluido. Salude a su guía en su hotel de Chengdu y suba a bordo de un vehículo cómodo y con aire acondicionado para el corto viaje a la Base de Investigación de Cría de Panda Gigante. A su llegada, emprenda un recorrido por el centro de investigación y sea testigo de pandas gigantes en cada etapa de desarrollo; obtén información sobre su fisiología y comportamiento de parte de los miembros del personal experto que los cuidan y captura fotografías de las majestuosas criaturas mientras mordisquean el bambú. Después de tres horas recorriendo las instalaciones, regresa a la minivan y aventúrate en el Templo Zhaojue para descubrir la fascinante historia del monasterio del siglo VII. Absorba el esplendor arquitectónico de las vías navegables tranquilas, los pabellones dramáticos y los terrenos interminables, luego revitalícese con un almuerzo vegetariano. En estado de saciedad, viaje a People's Park para ver a los lugareños que hacen su trabajo diario antes de presenciar la idiosincrasia cultural de Match Corner, un enclave en el que los padres intentan relacionar a sus hijos con otros bebés elegibles. A continuación, recorra las callejuelas sinuosas de la zona de Kuan-Zhai y escuche historias sobre el rico patrimonio de la zona. Pasee por la pintoresca zona peatonal para ver casas cuadradas de estilo Qing y deguste una exquisitez local en un atractivo puesto de comida en el vecindario. Relájese durante el viaje de regreso a su hotel después de su enriquecedora excursión privada. My family and I thoroughly enjoyed our private tour of Chengdu and visiting the Panda Breeding Center. Our guide was helpful, kind, and patient with my two small children. I would highly recommend this tour to other families traveling to the Sichuan province. It was our first trip to Chengdu and we joined this day tour on the 2nd day. in his personality. My husband and I are blessed to have him for the trip. 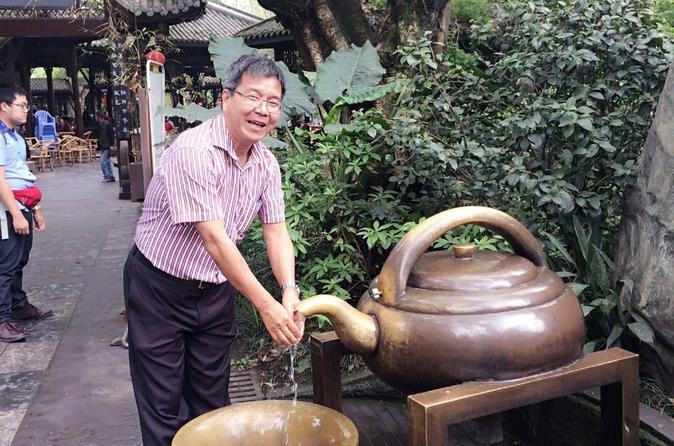 We will definitely recommend him to any tourist who wishes to visit Chengdu. Excellent tour! Our guide Martin was great! Professional, easy to communicate with, and very knowledgeable. If you want to see the sights (Wide and Narrow Alley, Peoples Park) and see Pandas this is the tour for you! Request Martin you won’t be disappointed. Jenny was terrific! My favorite day of my whole trip! Our guide, Rudy, was excellent and had actually worked at the panda reserve for 7 years so he knew exactly where to take us. Saw lots of pandas, both regular and red. The city tour was great and I would recommend the ear cleaning. Had a delicious vegetarian lunch at the Buddhist temple. Had plenty of time for shopping. Rudy explained everthing. Nice centre, Panda's well looked after. Our family of four had a wonderful tour with Martin!! Highly recommend him!!! We were picked up promptly at our hotel and taken to our first stop at the Panda Breeding Center. The pandas were very cute and a favorite for our family. After a couple hours there we then spent the rest of the day enjoying the Temple, People's Park, and Kuan-Zhai Lane. We enjoyed lunch at the Buddhist monastery and enjoyable cups of tea later in the day. Martin was very knowledgeable and it was a pleasure to spend the day with him. And since we are vegetarians he was able to help us select some delicious dishes for lunch. We wish we had booked another tour in Chengdu to be able to request him as our guide again. Overall the tour was just over 9 hours, a perfect day!! Just a fabulous day in and around Chengdu. Our guide, Mars, and the driving arrived on time at 7:30 and we were at the Panda reserve by 8. You need to be there by then or skip the whole deal - it gets crazy crowded. Mars knew her way around the complex and it saved a lot of aimless wandering looking for Pandas. We saw loads of the bears in every conceivable circumstance - eating, playing, sleeping. The babies are wondrous. Off to the largest Shrine in Chengfu and then Wide and Narrow Alleys and finally People's Park including a stop for tea. Overall this was an excellent and in our opinion, the ONLY way to see the Pandas and then city. A busload of 50 would have only made the day slower, less flexible and more crowded. The mini-van was clean and our driver Oh did a great job getting us around. Jeni was a great guide. She and our driver were also very kind to let us change our itinerary around at the last moment, so we could also get to the panda preserve where we got our pictures taken with the pandas. Also great food tips. Wish we had more time to spend in Chengdu. Our trip to Chengdu was amaaaaazzzziiingg!!! From the pick up with Martin at our hotel, to the Panda Research Base- early enough to catch some fun antics, to the Wide and Narrow Alleys and the Marriage Market at the People's Park- It was ALL Awesome! Well timed plans, a knowledgeable guide, and fun ensued! The best tour I've taken. We highly recommend Samtour and Martin!